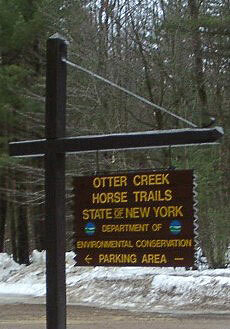 There are "THOUSANDS" of Acres of NY State Public Trails to ride directly from Camp Manestay. 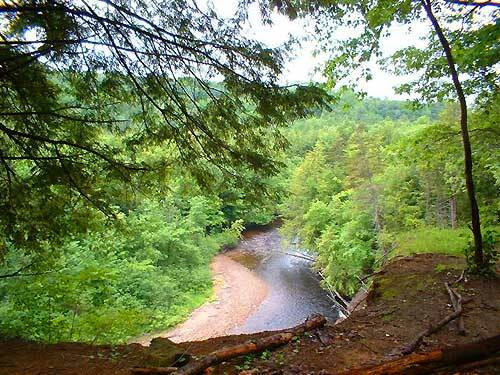 Otter Creek is one of the most popular trail systems. 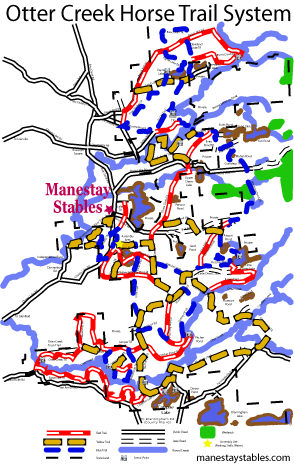 It consist of a series of interlocking horse trails comprising about 65 miles. They are located both on the Independence River Wild Forest Unit of the New York State Forest Preserve and on the Independence River and Otter Creek State Forests on the western border of the Adirondack Park in Lewis County. The trail system uses a series of old, sandy roads and woods trails to traverse a beautiful diverse area with the trails winding their way along spirea flats and wooded areas , accessing picturesque Adirondack ponds and following or crossing Otter, Little Otter, Beaver Meadow, Chase, Burnt and Crooked Creeks and the Independence River. The entire area is populated with wildlife, and with the trail passing through a variety of habitats you are likely to see deer, bear, coyote, fox, grouse, wild turkey, snowshoe hare and a wide variety of bird life. Catspaw Lake and Pitcher Pond often have resident or migratory wild fowl on them. Take NYS Rt. 12 to Glenfield. Turn into the hamlet of Glenfield. In Glenfield turn east onto Greig Rd. Go across the Black River and in approximately 1.9 miles the road will make a T-connection with Pine Grove Rd. Turn left. Proceed 1.2 miles and take a right turn (east) onto Chases Lake Rd. The entrance to Camp Manestay will be approximately 3.5 miles on the left hand side of the road. When staying at Manestay you have direct access to THOUSANDS of different trails. The most prominent trial system is the Otter Creek system. The Department of Environmental Conservation may close any area to public use whenever it deems necessary. Further, the department may refuse entry to any group or individual who for any reason is not properly equipped for wilderness travel. Areas will be used on a first-come-first-served basis. Lean-tos, horse shelters and corral areas must be shared to their capacity. Staying at Camp Manestay will ensure you have your SpotReservationTime. Groups, clubs and organizations wishing to conduct organized rides or events must apply for a permit with the appropriate regional forester's office. If you stay at Camp Manestay the have facilities to cater to Large groups. All groups of 10 or more must obtain a permit prior to camping on public land. Staying at Camp Manestay does not require any permits. Campsites shall not be set up within 150 feet of water, rails or roads unless specifically designated by the Department of Environmental Conservation. Camp Manestay has facilities to allow you to have campfires outside your campers or tents. Do not ride alone. Have at least two adults in party. Always let some responsible person know exactly where you plan to travel and when you expect to get back. Then carry out that schedule. Camp Manestay owners make a nice second person to log your trip with. Carry first aid supplies for rider and mount, including blue vitriol or similar antiseptic for saddle sores or chafing. Carry a supply of rawhide lacing for emergency repairs to reins, girth, etc. Halter should be worn under the bridle to tether horse. Carry fly spray and fly dope (during fly time) for horse and rider. Take along an extra horse. Horseshoe and nails, hatchet, jackknife with leather pouch. Each rider must carry enough grain for his/her mount. Normally during the summer months, some areas of grass can be found at various locations along the trail. A piece of light weight plastic 8' x 10' to cover horse, saddle and rider in the event of heavy rain is recommended. ***Camp Manestay owners are more than willing to help repair anything within there means and have a Saddle repairs man to handle anything above there capabilities. They also have many replacement supplies available. Horseback riding for pleasure has made a phenomenal growth in recent years. In large cities, suburban areas and rural communities vast numbers of people from almost every walk of life are learning to ride or are riding at present. In New York State we are indeed fortunate in having numerous areas and marked trails for this growing recreational use. State owned lands under the jurisdiction of the Department of Environmental Conservation provide a multitude of opportunities for the out door enthusiast who enjoys hunting or fishing, hiking, canoeing, camping or horseback riding. 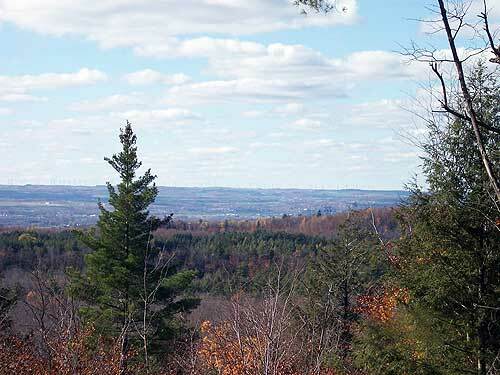 These lands consist of forest preserve holdings within the Adirondack and Catskill Parks as well as state reforestation areas and wildlife management areas across the state and are available for public use. Many of these trail networks provide support basic facilities such as hitching rails, horse shelters, lean-tos for the rider and adequate parking for cars and trailer which are on a first come first serve basis. Stay at Camp Manestay and be assured of your spot eservation and enjoy the Safety of a Maintained and Secured Facility. 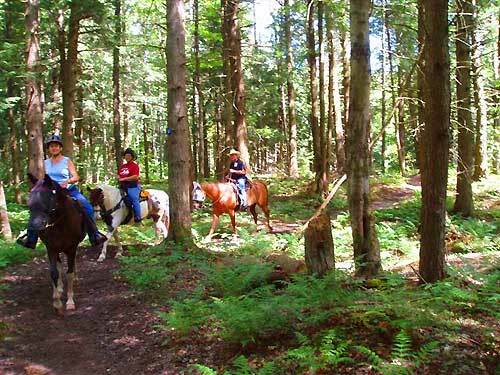 State lands fulfill a growing need for recreational trail riding and you are invited to use and enjoy them. Consistent with the multiple use management concept on publicly owned lands, you will encounter other recreational users, such as hunters, hikers, campers, and the like. Common courtesy is all that is required to ensure that such encounters are pleasant ones. Respect the rules and regulations which apply to the use of public lands and always seek permission before crossing private lands. Don't litter! If you carry it in carry it out! Keep camping, parking and corral areas clean. Leave them as you would like to find them. Park trailers and vehicle in spaces provided. Do not block roadways and trail entrances. Stay on designated trails. Do not cause unnecessary damage by trampling trailside vegetation. Respect other trail users. Dismount and lead your horse when greeting hikers or entering someone else's camp. Do not force hikers off the trail! Do not tether horses to live trees. Do not smoke on the trail smoke only at rest stops or in camp. Drown any campfires, then stir and drown again.